I make something healthy to eat. I recruit an unsuspecting friend or family member. The unsuspecting friend or family member eats the healthy food. This silly system of evaluation originated with my za’atar kale chips. Aubrey’s reaction after daring to take a bite of the crispy green chip was so epic — she literally froze, staring at me in silence with one brow furrowed for a full ten seconds before saying, “wait a second… these are healthy?” — that I knew she was sincere. (Also, let’s not forget that 5-year-olds don’t lie about liking vegetables — especially not dark, leafy, green ones.) And, that was when I knew that these kale chips were really, really good. 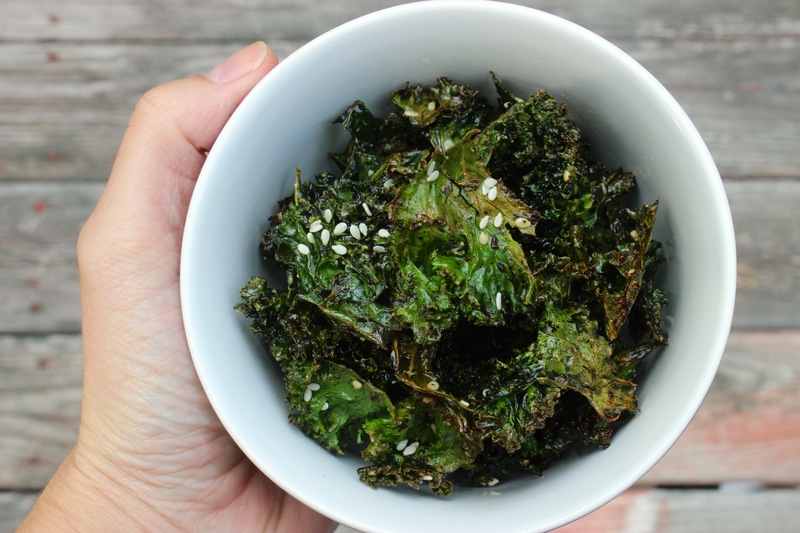 So, what is it exactly that makes these kale chips so delicious? Two things: their super-savory-and-satisfyingly-salty flavor and their robust crunch. 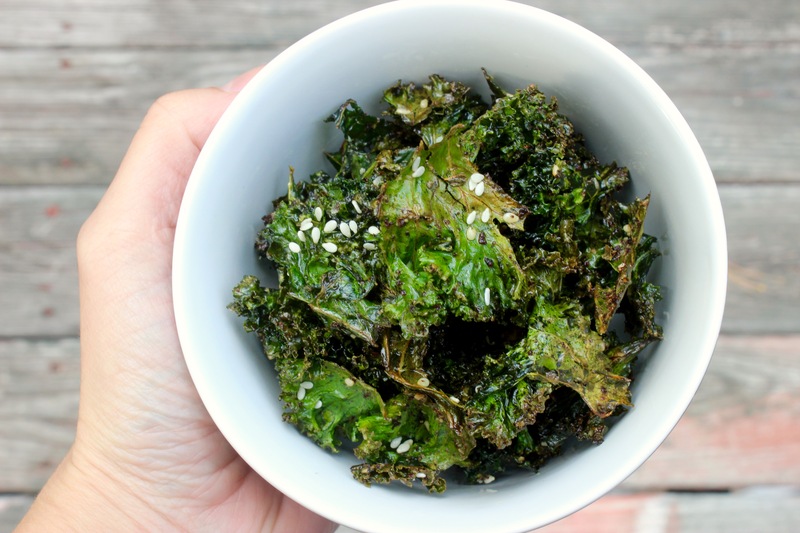 Follow these simple steps and you’ll be making perfect kale chips —and skewing eyebrows in disbelief — in no time. First, preheat your oven to 300 degrees Fahrenheit. While the oven is heating, remove (and discard) the tough, fibrous stem from each of the kale leaves. Then, tear the leaves into large, equally sized pieces. Next, wash and dry the leaves. It is very important that you dry the leaves thoroughly with a salad spinner or clean kitchen towel — if you don’t use dry leaves, you’ll end up with soggy chips. Drizzle oil over the kale. Use your hands to rub the oil into the leaves; they should be covered with a very light coating of oil. Then, sprinkle the leaves with salt and seasonings. I use za’atar but you can feel free to use your favorite spice blend. Toss the leaves until the spices are evenly distributed. Spread the leaves in a single layer on an unlined baking sheet. 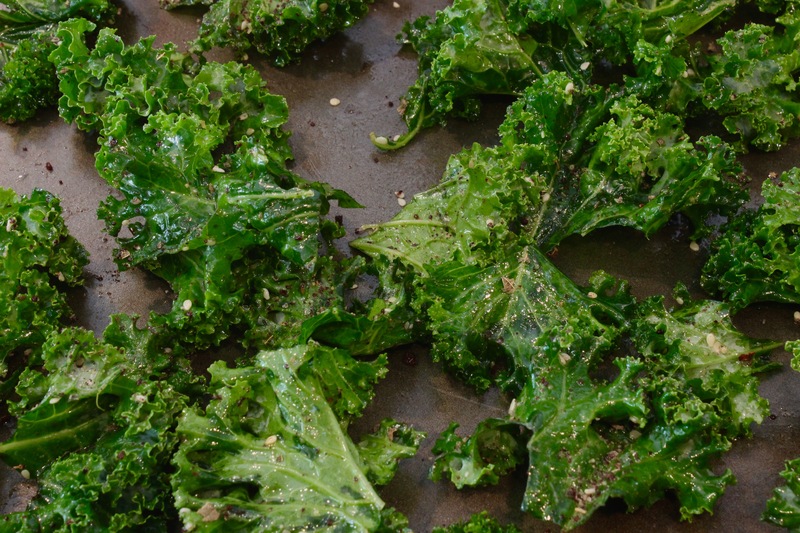 Bake the kale for 20-25 minutes, rotating the pan after 12 minutes. The chips are done when they start to brown around the edges and no longer feel soft in the center. Allow them to cool on the baking sheet. 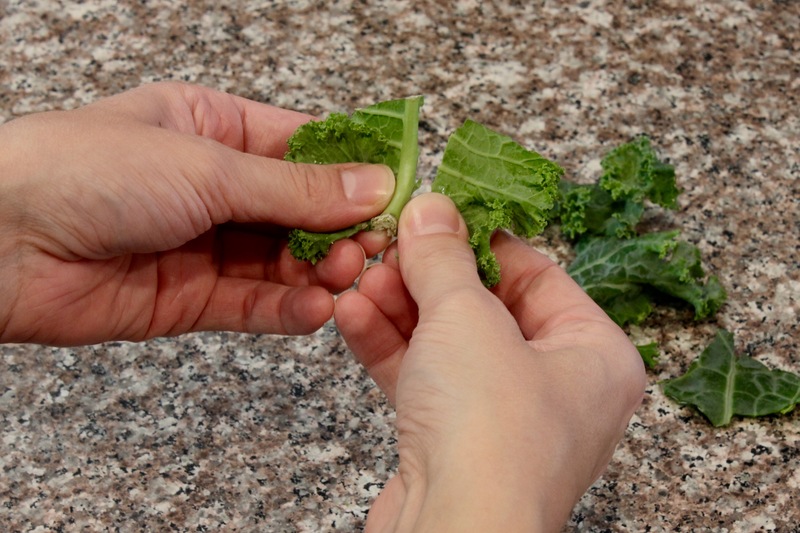 Remove and discard the stem from each of the kale leaves. Then, tear the leaves into large, equally sized pieces. Drizzle the oil over the kale. Use your hands to rub the oil into the leaves. Then, sprinkle the leaves with the salt, za’atar, and sesame seeds. Toss the leaves until the seasonings are evenly distributed. Spread the leaves in a single layer on an unlined baking sheet. Bake the kale for 20-25 minutes, rotating the pan after 12 minutes. The chips are done when they start to brown lightly around the edges and no longer feel soft in the center. Allow them to cool on the baking sheet.